Freshwater birds are birds that live near rivers and lakes, instead of the ocean or sea. These birds are usually expert divers and swimmers and have thick, downy feathers to keep them warm. Some freshwater fish migrate during the winter to warmer waters. Others live year-round in warm areas. 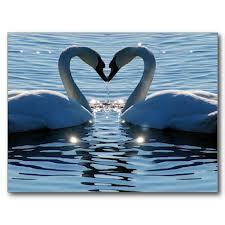 All about Freshwater Birds: Swans kissing. Think about the birds that live near water in your area. Geese or ducks probably live in parks or near golf courses. You might find a blue heron or kingfisher near wetlands and swamps. If you live down south, you might even spy a few flamingos or storks. Wherever you live, freshwater birds are fun to watch. 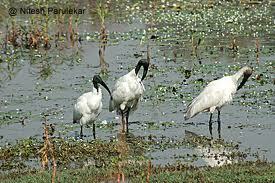 Most of freshwater birds are carnivorous, eating insects, fish and frogs. Ducks and geese live on almost every continent in the world. Swans mate for life. They touch beaks to kiss. Flamingos are pink because of the food they eat. Freshwater birds are birds that live near rivers and lakes, instead of the ocean or sea. A Martha Stewart episode of how to raise geese and ducks. 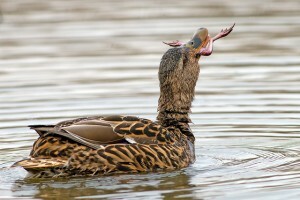 Question: What do freshwater birds eat? Answer: Most of them are carnivorous, eating insects, fish and frogs. Some birds eat water plants, fruit and seeds. Enjoyed the Easy Science for Kids Website all about Freshwater Birds info? Take the FREE & fun all about Freshwater Birds quiz and download FREE Freshwater Birds worksheet for kids. For lengthy info click here. Declan, Tobin. " Freshwater Bird Facts for Kids ." Easy Science for Kids, Apr 2019. Web. 20 Apr 2019. < https://easyscienceforkids.com/all-about-freshwater-birds/ >.